Research has shown that an Instrumented Direct Feedback Device displays real-time CPR performance and significantly increases the ability to perform quality CPR; specifically to achieve the recommended rate of 100-120 compressions per minute and the recommended compression depth of 2 inches (5-6cm). RUH is affiliated to the American Heart Association (AHA) and the Irish Heart Foundation (IHF) and is a registered training site for Basic Life Support Education (BLS). The AHA as of 31 January, 2019 require the use of Instrumented Directive Feedback Devices on all AHA courses that teach the skills of Adult Cardio Pulmonary Resuscitation. 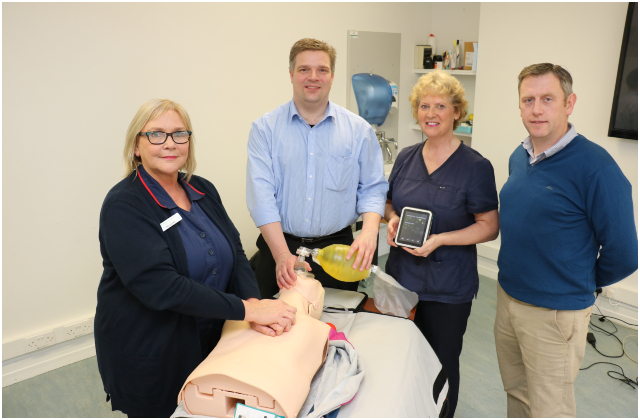 Pictured with one of the new IDFD Resuscitation Manikins at RUH, from left: Margaret Kelly, Advanced Nurse Practitioner Diabetes; John Battye, Clinical Educator Cardiac Services; Anne Scahill, Resuscitation Officer and Fintan McLoughlin, Senior Biomedical Engineer.